Today, I will take a page from the RoW80 blog post about leaving one’s comfort zone, doing something one has never thought one could do. I’ll start with a small thing. Last Friday night, I went to a fundraiser at Eden’s son’s school, where the main event was painting a version of the painting being done by an artist (there were two, actually) at the front of the room. I went because I knew it was a good cause, but I was dreading doing the painting. I have not painted anything other than walls and doors since 6th grade, and was convinced that the world was better off for that fact. To my surprise, I did far better than I expected. My painting will never grace a gallery, and was darker and less detailed than the original, but I did not feel it needed to be consigned to the trash. A baby step, but one that felt somehow momentous. A larger baby step out of my comfort zone is NaNo rebellion, which is going rather well. I have officially signed up for NaNo only once before, quitting at roughly 16,000 words. I have more than that now, and I am still writing, some new words as well as editing old ones. While the majority of the new words are from working through the details of the conflict and the scenes, they count as foundation, even if they might not all end up in the next draft. After all, 50,000 brand new words from NaNo may not all end up in the next draft either. There are many more baby steps to take me further from my comfort zone, but each step helps. I haven’t yet nailed all my goals for this Round, but I am doing much better than at the start of the Round. I plan to concentrate on the organizing goals, which call on different creativity from me, and which don’t come as easily. Where are all of you as we have turned the bend and are in the last half of this Round? Are there goals you need to tweak? I’d love to hear how everyone is doing. June is a tough month for me, and not because I’m in JuNoWriMo, although I am trying valiantly to keep writing and working on good habits. It is the worst month in the day job, because I have two conferences, one at which I often present, and the other with attendance and note-taking demands, as well as a 6-7 page annual report. On the personal front, June contains several family birthdays, and two death anniversaries. I will gladly see June in my rear view mirror. Last week was consumed by a conference on Long Island where I had a short piece of a group presentation. We took the scenic route through western Connecticut and then a ferry across Long Island Sound. We managed to sneak in some sightseeing of the historic areas in the Setaukets and Stony Brook, which was fun, and the ferry ride was a nice break from the driving. On the way back, we cut over into New York and took the Taconic north to its terminus. Driving the Taconic was on my father’s bucket list, and I remember how pleased he was a few years ago when I told him we had driven on it. Luckily, the next conference will fall between the Rounds, so it shouldn’t greatly affect my goals (fingers crossed). I appreciated Eden’s comments on the ROW80 blog about what goals are Attainable (the A in SMART goals), but I hope that Round Three will bring some surcease at the day job. Speaking of goals, how did I do these past two weeks? Two blog posts per week–Sunday check-in and one other. Only one the first week, since I missed last Sunday’s check-in. Two this week, with a Father’s Day post and this check-in. Five sentences of fiction per day. Yes, sometimes an average over a few days, but often I write every day. Editing one page per day. No. The past two weeks I have been preparing to apply for a sabbatical to finish this book. Walk ten minutes per day. Yes, easily. I will increase this goal in Round Three, since ten minutes is too easy. Balance exercise every morning. No. I managed to keep up 80% of the time, but not when I was away, and sometimes on cazy stressful mornings, which are sadly the exact times I need the exercises! Plan every day the evening before, and schedule time for all the above. Not every day, but about 80% of the time. Next Round, I want to add more work on preserving the times I set. I let work situations affect me far too often. Happy Father’s Day to all who are fathers, and to all who have fathers. May the rest of the day be relaxing and restorative. I missed last week’s check-in, sorry to say, just out of general meh. The day job continues to be stressful, and I am not learning how to disconnect from it fast enough to suit myself. Upon my return to work after the conference in Vermont, I found that we had no air circulation or air conditioning in the building, because “annual routine maintenance” was being done. Last week, the air handlers were turned off for “annual shutdown,” because there were no students on campus last week. While great for anyone wanting to write about the feeling of living in central Florida in June in the 1800’s, it was not very conducive to getting anything done. The highlight of the two weeks was graduation, however. I never turn down a chance to wear my academic regalia, and marching through the rows of family and undergraduates to the platform is a lot of fun. Their enthusiasm and happiness is contagious, even if I turn a little jealous hearing about summer plans from those who have the summer off. Also, on a brighter note, I managed several phone calls for self-care and some reading, neither of which I had done in the longest time. Eden mentioned on the check-in sharing what we are reading. I am several books into a series that Eden recommended to me, Anne Perry’s William Monk series, which I am enjoying greatly. 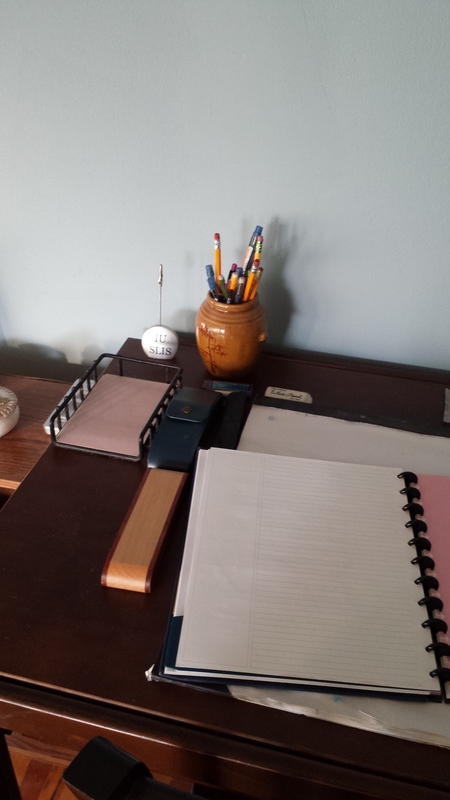 Writing: Two blog posts per week–Sunday check-in and one other. Sadly, no. Editing one page per day. Yes. Wellness: Walk ten minutes per day. Actually, I did meet this goal and beyond, walking between 24 and 64 minutes a day. Balance exercise every morning. Not every day, but some days. Planning: Plan every day the evening before, and schedule time for all the above. Yes. I hope all my friends in the States enjoy their Memorial Day holiday, and a good week to all. It was a meeting-rich week at the day job, and the sort of meetings that leave one absent a brain at the end of the day. At some point during the week, my husband sent me a picture of socks which said “This meeting is b***s**t.” Later in the week, I saw a similar pair and other wonderful ones at a book/gift shop next to where Eden and I met for writing time. It is always dangerous for me to enter a bookshop, because I am so torn between getting ALL the books, and being guilty about buying any books that I cannot justify sitting down to read. I do listen to audio books, and read e-books, but I find it difficult to sit with a print book and read for pleasure. I hope this inability passes soon, since I usually love to read physical books. I am not in the best place with the day job right now, in that I am constantly pulled away from the work that matters to attend meetings about things that do not matter. The good thing is that my muse sometimes performs well under stress. Thus I am at times madly writing in my head, jotting down a phrase or two so as not to forget what I was thinking. On the negative side, I am starting to slide back into the Slough of Despond. I plan to investigate medications and/or therapy again, to see if I can moderate the slide before it gets too entrenched. One blog post per week. Some weeks this will probably be my account of how I progressed on my goals, but I hope to expand to other posts. Last Friday I went back to my Lapidary Prose blog, and posted a very short piece about hope. Most of my former followers have unfollowed the blog, and I don’t blame them. I plan to continue to post there and put the links on Facebook and Twitter, slowly building followers again. I have a Mother’s Day post written, and a Father’s Day post drafted. Five sentences of fiction every day. More will be cherished and coddled, but five is required. My return to the day job disrupted my daily writing routines, but I am slowly getting it back. Thursday I met Eden after work, and ironed out more details about my hero and heroine in the World War II novella, figuring out where and how they might have met, and further details about their backgrounds. I’m still struggling to find a good time to work on the daily writing. After brainstorming with the husband, I am going to try a different approach and write in the mornings before the day job. I’ll report on my progress next week. Half an hour of editing the non-fiction book every day. Yes, it’s not always pretty or fun, but necessary. This editing did not happen every day, which was disheartening. I had planned to do it during lunch break at the day job, but I sometimes get pulled into meetings so that I don’t get a lunch break. I am involved with an academic writing group that keeps me somewhat on task for that sphere of writing, but we are on a break right now, and I don’t have the incentive to keep up as much as I do when we are reporting every week. Have a great, fruitful week, everyone! Two weeks in. Happy Easter, happy Passover, happy April 16th, however you may be inclined. I’ve been doing well on my goals, so I’m in a pretty good mood. Last night, I wrote 2916 words on a set of blog posts for next year’s A-Z challenge. Yes, I know that’s a year away, but I find I should write things when I want to write them. Well, I write every day, but I sometimes let inspiration guide what I write. I also wrote 643 words yesterday on a different blog post that should go up reasonably soon, and last Wednesday I wrote about 300 words for a Mother’s Day post (handwritten, so harder to count) and spent a lively few hours discussing my characters in the World War II novella with Eden. It was good to discuss and share on such a bittersweet day–Wednesday was the third anniversary of my mother’s passing, as well as my youngest son’s 24th birthday. It was also very good to write. Oh, and because I saw an interest in writing spaces mentioned on Facebook, here’s the writing space I had in the last house (we moved in July 2016). One blog post per week. Nothing posted this week except for this one. I do have seven more in draft that I hope to post soon. Five sentences of fiction every day. Yes, most of it on Wednesday, but I’ll definitely take it. Half an hour of editing the non-fiction book every day. Four days this week. A rare Wednesday check-in from me, totally due to meeting Eden who (kindly) informed me I was going to write and post tonight. I needed that accountability, and here I am. Until today, I hadn’t written anything outside of the day job. I have been exhausted and needing to fill the well for over a month. I now understand on a cellular level that good stress is as debilitating as bad stress, because moving into this lovely new house and neighborhood has beaten me to a pulp. I come home from the day job exhausted, and do nothing but play computer games and read. The good part? I do spend a lot of weekend time going through boxes in the garage. It will be a nice, efficient, welcoming house when I am done. The bad part? I’m not writing. I have yet to find the correct configuration for my office that allows me to retreat without guilt. It doesn’t help that it has been one of the hottest few weeks I’ve weathered here in the past four years. I wake up thinking I’m back in north central Florida. Well, I’m tough, and I will persevere! Please visit the other RoWers here if you have a chance–the accountability is a key piece of the challenge. If you are interested in joining the RoW80 challenge, this FAQ will give you all the details. Feel free to jump in anytime. After a long absence, Eden made me write this scene this afternoon (thank you, Eden). I added the 8 + 10 + 2 +1 + 6 for 27 sentences, and one more that had to be there for sense. “What?” Carol gaped at her. “I like fast.” Carol grinned. WIPpet Wednesday is a blog hop where writers share part of their WIP here. The only requirement is that the length have something to do with the date, hence the maths above. Feel free to read, comment, or join in!